Day hiking means just that, out and back the same day. This means you don't need to take tents and much cooking/gear if any. But it does NOT mean to be unprepared for unexpected circumstances. Dramatic weather changes, injury or other factors could possibly cause your day hike to be extended. Heck, you might just fine a great spot to view the stars and want to spend the night outdoors; weather/conditions permitting. Hikers should always be prepared for a wide range of temperatures and weather conditions while hiking anywhere but at higher altitudes, the temperatures can swing dramatically from daytime heat to nighttime cold. For any extended hike it’s best to prepare for a variety of conditions and pack accordingly. Dress in layers and always carry rain gear in your pack. Some extra dry socks and underwear may come in handy too! The following day hiking gear list is a good starting point before heading out on your next hike to help ensure that you’ll have all the essentials. You may want to add or remove items based on expected conditions and your personal needs. Backpack – but not just any backpack. Make sure it is suited to your frame/size and sits comfortably. Select one that has hip/waist supports so the weight of the pack rides on your hips, not on/over your shoulders. Select a back pack with adjustable straps and one that has a firm structure or webbing that lets the pack ride away from your back. Otherwise, if the pack sits against your pack directly, it will act like a thermal blanket and cause discomfort to overheating. Supportive footwear - designed for the length and terrain of your hike. We have seen too many folks on steep hiking trails with the incorrect footwear. Some even wearing flip-flops and open sandals. This is asking for a stubbed toe or a trip/fall over a cliff. There are numerous selections; some so varied it will boggle your mind. Visit a good outdoor store and talk to a knowledgeable footwear specialist. Hiking in wetlands requires different foot gear than hiking mountain trails. You may find you will collect a good set of varied footwear over the years. But always make sure that your selection is comfortable! Gloves – optional but could come in handy for some rough terrain. A good lightweight pair may come in handy. Water: This is a critical thing to always have with you. Carrying a water bottle is a pain and having one in your backpack may be difficult to reach. We recommend a backpack water storage bladder. We avoid those special backpacks devoted only to water as they are impracticable for carrying other necessary supplies and are over-priced. Our Osprey backpacks have a special pouch and holes for water tubes; you can purchase different sizes for different locals and durations. They are ultimately practical to take a sip along a difficult route so you stay hydrated at all times. Extra food: Snack bars and trail mix make for a great snack while taking a rest break along your trek. We recommend vegan healthy bars/mix. We found that Nugo Dark and Skout organic bars are delicious and nutritious. Even a handful of Jelly Bellies can be a nice treat. Variety will keep things from getting boring; you only need a handful. Trail Map and/or Guidebook – In many areas GPS just won't work. Don't know why but it is true. Especially if you use your cell phone for GPS/navigation. Always carry a paper/reliable (and maybe water proof) map/guidebook/trail-map with you! Compass/GPS (with the knowledge of how to use it) – The latest in GPS hand-held units are a marvel. They often are equipped with an excellent compass. You can 'mark trail' with them so you won't return to the wrong trail-head (which we have done!). We are using a Garmin eTrex 30. Even so, a trusty magnetic compass takes up little space and is always reliable; Nancy has one built in to the top of her walking stick! Emergency Blanket (smaller than a wallet) – handy for a nice dry picnic blanket or cover in a storm. Waterproof matches / fire starter – you never know when/where you may need to start a fire. There are small kindling packs you can carry too. Knife – They come in a variety of sizes but a strong sharp blade can come in handy for a host of uses. We carry a Gerber belt knife and also have a Gerber Fisherman's Multi-Tool. with a variety of blades/attachments. Flashlight or headlamp with new batteries – These are easy to stow in your pack. We carry a LED headlamp along with flashlight (stored in our waistband pouch) that both take AAA batteries and carry plenty of spares in a waterproof baggy in the bottom of our packs. Storm Whistle (in case you got lost) – Great when you don't have a locator beacon. Remember you CANNOT depend on that cell phone in the forest/mountains and many cities! Small mirror (in case you got lost) – flashing a mirror is a great way to draw attention should you need assistance. Nylon Cord - this stuff is STRONG and can be used for a variety of uses from binding up some firewood to carry back to a camp sight or bind branches for a lean-to shelter. Watch/Timekeeper – Preferably waterproof and impact resistant. Timing can be everything. You will need it to let you know when to mark your return or take a break. I use a 'Pebble' that can also control my tunes on my cell phone and let me know the weather (when cell phone data links are available). Many/most handheld GPS units will have time keeper functions built in. First Aid Kit – Put together a small aid kit from your household supplies or purchase a ready made travel kit. We carry a large one in the car but also carry some necessities on the trail. Bandages (small and large), antibiotic ointment/cream, a small bottle of iodine, gauze, clean cotton handkerchief and tape (plastic electrical tape has multiple uses!). You can also get Moleskin bandages for those blisters if you get them but small bandages are usually good enough. Safety pins are great for a popped button. Hopefully a splint will never be necessary but with your knife, nylon cord and some branches you can make one! A small spray bottle with isopropyl alcohol is also very handy for antiseptic use; good for cleaning your glasses, camera lenses or binocular lenses. If in a woodsy area, check the local ranger station for proper snake bite kits. Carrying a Bee Sting Kit may be something to consider as well. Personal medications – hopefully these are few but don't forget them. Insect repellent – We recommend natural repellents. There are sticks, creams and sprays you can purchase. There are also natural repellents you can spray on your clothes, shoes and packs that will last several washings/cleanings. For ticks/fleas you can use cat collars around your ankles (over socks) or hang them from loops on your pack. May look silly but they work! Sun protection (sunglasses, sunscreen, lip balm) – Again, we always recommend natural creams/lotions/balms. There are several made from all natural ingredients. Many sun screens are laden with chemicals so a natural creams are best. Zinc oxide creams are the best as they don't penetrate the skin, are water/sweat resistant and inexpensive. Don't forget the sun is beneficial just don't get a burn; produces vitamin D naturally. Wide-brimmed hat – protects from glare and saves from a bad head-burn (especially with us guys who are getting thinner on top!). Also keeps the rain out of your eyes so get a waterproof chapeau if possible; you WILL get caught in a rain shower eventually! I have my trusty hat and Nancy has several (leave it to a woman to want different styles). Plastic bags – Great for storing artifacts you might pick up along the way. A shell here a pretty rock there. Always be aware of the legal rules/regulations before picking up and taking things in parks and hiking areas. You can double use your sandwich bag for such uses as well after that lunch break. Zip-Lock bags tend to be pretty waterproof/safe so if you want to take a water sample or something else, great to have a couple of these. Paper Towels & Garbage Bag– great for a lot of thing from cooling compress in a local spring/stream to cleaning up tools and equipment. Small plastic garbage bags make it easier to take back what you brought. DO NOT LITTER and DO NOT FEED ANIMALS. Toilet paper (in a plastic bag) – you never know when you will get that 'urge' and the ladies always like a little tissue when there aren't facilities available or those facilities are devoid of proper tissue. Most outdoor shops carry small rolls easily stored in your back. If required some 'feminine' products may also be in this category so pack what the lady needs! Money / ID – Carry them in water-proof pouches and secure them on your person. Drivers license/passport and cash are necessities. Credit cards may not be of any use in some small out of the way locations or if there is a storm and/or power outage. 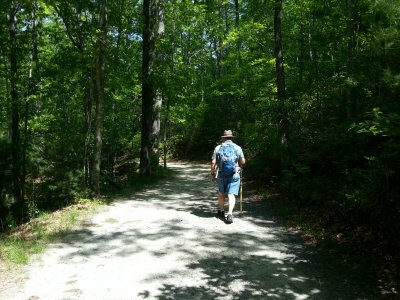 Hiking Sticks / Trekking poles – We find these invaluable; especially for us older hikers. We prefer natural wooden poles and have several we have picked up along the way. Some you can find 'raw' and treat/stain them yourself. The nice thing about wooden poles/staffs is that you can adorn them with all those hiking medallions you will find in almost every National Park and some State Parks. Maybe it is braggadocios but darn, show off where you have been! They add stability in uneven terrain and may stop a nasty/dangerous fall! Water Filter / Water purification tablets – If you carry a sufficient water bladder in your pack these usually will not be necessary. If you are tempted from drinking from that beautiful natural stream, be careful there are unseen bacteria/bugs that can be harmful. If you run dry, a good water filter or purification treatment to refill and/or use with your bladder is essential. Camera & Extra Battery – Most cameras today are digital so run off batteries. Make sure you have a spare set. The last thing you want is to find yourself with the 'perfect scene' and have no power for the camera! Either carry extra replaceable batteries or purchase additional custom battery packs that your camera requires. I carry an extra 5-hour battery and use an 8-GB SD card that will hold about 8,000 1080p images and an hour of video. Carry extra SD card too! (Oh and get the fastest one you can, it will refresh faster! Binoculars – optional but nice for that long view or essential if you are into nature bird watching or animal life. The prices, styles, power and price vary dramatically so visit a store and try some out; then shop for the best deal. I often carry my older/larger but more powerful binoculars while Nancy has a smaller collapsible pair in her pack. Cell phone - Carry one, but don't depend on it for voice, data or especially GPS. Good safety item but be prepared to exist without it for hours at a time. A handheld trail-ready GPS will usually find a signal; even in the most remote locations. Just find a clearing or hill and you should be able to figure out where you are and where you want to be! Gaiters (worn over the shoe and lower pants leg) and Velcro straps – for securing your lower pant leg if walking/hiking through dense brush. Stickers, nestles, burrs and other pokey things along the trail will attack your ankles/legs and creepy crawly things my try to crawl up your legs. These can really help if you are off-trail hiking. Bandana or Neckerchief can be handy to protect your neck from sun and absorb sweat. Carry one to mop your brow or wear around your neck. Colorful and distinctive styles abound. Well, That's All Folks - Happy Trails & Safe Journey!